At an intimate ceremony on the Coral Gables campus, the University of Miami College of Arts & Sciences officially appointed Dr. Anjan Chakravartty as the inaugural holder of the Appignani Foundation Chair for the Study of Atheism, Humanism, and Secular Ethics. Noted as the first named faculty chair of its kind in the United States, the endowment was made possible by a $2.2 million gift from the Louis J. Appignani Foundation. During the ceremony, the University also received the American Humanist Association University Award for Philosophical Diversity from association president Sunil Panikkath. “My objective in funding this chair is to put atheism on an equal footing with theism as a method of studying human behavior and human ethics,” said Louis Appignani, a noted entrepreneur, philanthropist, and longtime supporter of the College of Arts & Sciences. The Appignani Foundation Chair, now held in the College’s Philosophy Department, will implement new interdisciplinary courses, research, and scholarship within philosophical, historical, and scientific concepts. Anjan Chakravartty, who joined the department of philosophy in July 2018, previously served as director of the University of Notre Dame’s John J. Reilly Center for Science, Technology, and Values, and specializes in the philosophy of science, metaphysics, and epistemology. He has also held fellowships at the Universities of Pittsburg, Edinburgh, and Sydney, as well as a research fellowship at King’s College, Cambridge. 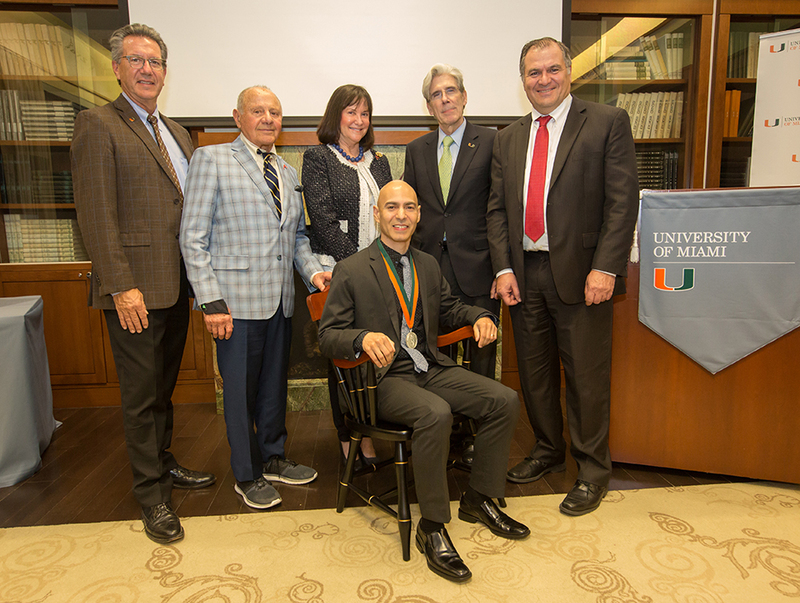 The creation of the Appignani Foundation Chair is also a part of University of Miami President Julio Frenk’s 100 Talents initiative, which aims to establish 100 new endowed positions by the University’s centennial in 2025. “When visionary leaders like Louis Appignani make gifts to endow faculty chairs, they really create permanent legacies that link their names to lineages of holders of that chair,” said President Frenk. Established in 2001, the Appignani Foundation supports creative-thought organizations that spread humanistic values, expand creative educational opportunities, encourage long-range critical thinking, and emphasize scientific reasoning.